It’s usually easier to view changes to a sport like fishing looking backwards, rather than in the present or especially future. That’s why it’s difficult to call the custom ice rod boom we’re seeing now a revolution, given pioneers in the rod-making business like Thorne Brothers have been doing it for decades. Yet, for as long as a these tools have been around, it seems that only in recent years are they gaining widespread acceptance throughout the ice belt. That’s likely due to a number of factors, not the least of which is increased interest in the sport the last 10 years or so. Having fished and followed this trend over the years, and in designing a number of custom ice blanks myself, I think it’s time we discuss their popularity, and why they’ve become such a hot-ticket item in today’s ice market. First off, we’ve been here before in the open water side of the world, and the development of customized rod blanks to approach specific situations, lure types, and species is certainly not a novel idea. I went to college in the mid-late 1990’s less than an hour from the St. Croix Rods factory in Park Falls, WI, and they along with G. Loomis were some of the early leaders in the space. Around that time, higher modulus carbon fiber, which was lighter, stronger, and more sensitive, saw more widespread use and adoption in such companies. As anglers realized their benefits for all kinds of applications, it set off a flurry of designs, lengths, and actions, which became more feasible to build due to the new materials and methods. Yet in the ice rod market, true customized rods were all that was available in the beginning, where anglers would describe lengths, powers, and actions, along with thread colors, blank preferences, and custom signatures or artwork. These were hand tied items, not mass-produced, but careful creations of a few talented artisans. Today, that workmanship still exists, though be wary of the term “custom” and how it’s used. True “custom” ice rods are a razor thin percentage of all custom ice rod sales, as most are rarely built to a customer’s individual input and specs for a number of reasons. First and foremost, that process is slow and requires much more time and effort as rod builders labor over lengths, guide-spacings, various colored threadwraps, and the like. Then, they switch out and build something else completely different. That’s why instead of being truly custom, they’re instead “customized” to fit sweet spots in power, length, and action that are more popularly saleable to the general fishing public. It allows ice rod companies to build up inventory, and sell to the retail environment. Even the most fervent of custom shops sell relatively few true customs, as it’s difficult to charge what it takes on a per-rod basis for that level of service. That doesn’t make the majority of these not-so-custom creations less desirable however, far from it in fact. Most are still handmade and are major upgrades from your traditionally mass-produced ice rod. At this point, I’d have a very hard time going back to stock rods, given the way these customized ice rods cover the full breadth of species and applications I love to fish. Whether a true custom or customized, I’ll be taking advantage of new offerings and technologies in this space for some time to come. Glass rods eventually gave way to solid carbon blanks, and carbon is still today the most heavily used material in custom ice rods. These blanks are typically ordered in by an overseas manufacturer, and in some cases ground to spec depending on the rod being built. Just like many years ago in the open water market, there’s only so many ways to mill these down to achieve differing powers and actions. It’s a well-understood process, and some great rods feature solid carbon designs. This year, the advent of tubular (hollow) design, which has proven so popular with the highest-end rods on the open-water side of the market, has been brought to custom ice rods by St. Croix via the Croix Custom Ice (CCI) lineup. The result is an even lighter and more sensitive blank than other high performance custom ice rods to date. I anticipate the exploration into tubular ice rod design to be in its infancy, though increased attention to ice anglers and their needs will surely lead to rapid development and possibly even different materials and methods. All of which is a long way of saying we live in a great day and age of ice angling. Just as we’ve grown accustomed to technique-specific live-bait and jigging rods on soft-water, we’ll become just as spoiled with sight-fishing and spoon rods for the hard-water. The result will be just as impactful as it was 20 or so years ago for me the first time I picked up a rod designed for properly fishing a jig. I learned feel, mental mapping of the bottom, current, and sway, all while being able to detect bites and drive a good hook home with much more effectiveness. All of these attributes led to a better presentation, and thus, more fish both detected and landed. 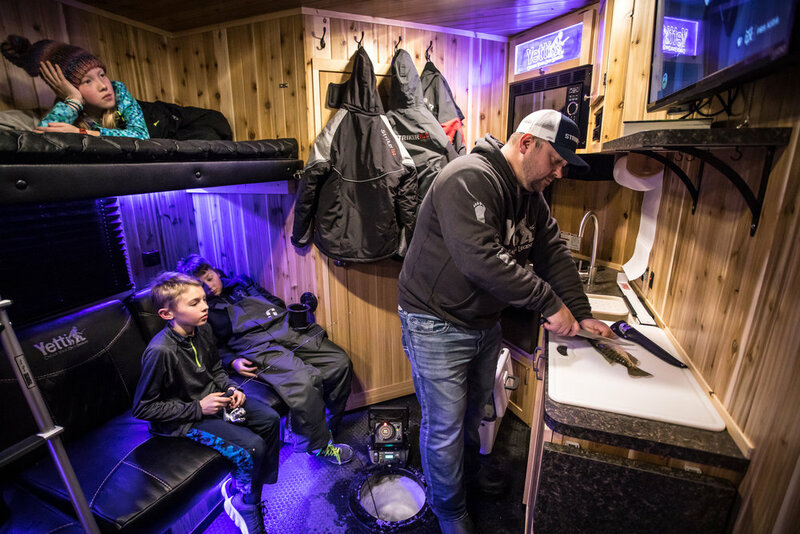 It’ll be the same for a whole new generation of ice anglers that embrace today’s customized ice rods. Eventually, they won’t remember what came before them, and likely won’t fish with much else.